It’s cool stuff, although I’m a little doubtful about it working well for general web content. It would be a fun experiment, though! 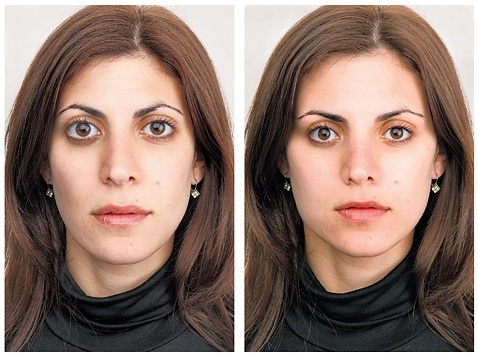 Also in the news today is this New York Times article (via Neatorama) about an automatic “beautification engine” that modifies images to make the people in them look better. A month or two ago this stupid little icon showed up on my menu bar. I found it kind of amusing (in a sad kind of way) because it appeared out of the blue, without my having approved anything, and the dropdown menu had a bunch of redundant items that were all variations of “you are not using MobileMe”. 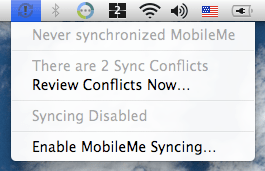 I noticed today that now it’s complaining about sync conflicts. Which is also kind of sad, because I *still* have never used it, and have no idea what those conflicts could be for (turns out they’re for iCal conflicts… but I don’t use iCal any more). It even *says* that I’ve never used it, and that syncing is disabled!